In Great Britain, Remembrance (or Armistice Day) is observed by a tribute of silence at the 11th hour, of the 11th day, of the 11th month, when hostilities of the Great War ended. The Great War was followed by the Second World War merely two decades later - a conflict that resulted in the deaths of up to 60 million people. On top of this figure were an unprecedented number of animal fatalities, with countless horses, mules, camels and dogs perishing in the line of duty. On this one day of the year, it seems only fitting to reflect on the huge sacrifices made by thousands of animals during the First and Second World Wars. The ‘Animals in War’ Memorial in London’s Hyde Park is inscribed with the words ‘They had no choice,’ yet unreservedly applied their strength, perseverance, loyalty and intelligence in a way that influenced the course and success of the British and Allied war effort. Horses – perhaps the most widely utilised draft animal in wars over the centuries, were used for transportation by all combatant forces, carrying heavy supplies and ammunition over the muddied terrain of the Western Front. They also took their charges bravely into battle, negotiating the gutted ground in a way that trucks could not. In the First World War alone it is estimated that some 8 million horses, donkeys and mules were destroyed in combat, with 7,000 dying in one day alone at the 1916 Battle of Verdun. With the outbreak of WWII in 1939, the use of horses for cavalry charges and hefty transportation continued with a vengeance, with the horse being thought of as a cheap and reliable asset. The German Army particularly, who had issues gaining the oil needed for fuel, enlisted an average of 3 million horses and mules over the course of the Second World War. In just two months, 179,000 German horses perished on the Eastern Front, either in battle or from disease or starvation. The popular novel and motion picture, War Horse, tells the story of a young man and his thoroughbred, Joey, who are separated with the outbreak of the First World War, only to be reunited after both having endured the horrors of warfare for a painful half-decade. Although Joey manages to survive, the story sees many horses brutally injured and killed, which was the reality for the majority of war’s faithful steeds. In 1947, 2 police horses named Olga and Upstart were awarded the Dickin Medal for honour, service and bravery after immediately returning to duty following major London explosions that saw the entire area (including the horses) showered in glass and other debris. The same year, another police horse named Regal received the award after remaining calm and composed in two incidences where it’s stable was set on fire by explosive incendiaries. Between 1943 and 1949, the Dickin Medal was awarded a total of 54 times to animals whose bravery needed special recognition. Every animal involved in the wars of 1914 and 1939 deserved to receive this award, yet the bravery of the masses could never be credited. Olga, Upstart and Regal were amongst those animals acknowledged, along with 18 dogs, 1 cat, and 32 carrier pigeons. Like horses, dogs played a decisive role in WWI and WWII. Sergeant Stubby is possibly the most decorated dog of the First World War, having been smuggled onboard a ship of American soldiers destined for France. The dog soon achieved the rank of Sergeant and served in the trenches for 18 months, participating in a number of battles and offensives, whilst helping to locate injured soldiers and warn his men of imminent gas attacks and shell-fires. Stubby is also credited with detecting a German spy and assisting in his capture. But Sergeant Stubby wasn’t the only dog to aid the course of the First and Second World Wars through bravery, perceptiveness and training. Many dogs were enlisted in the war effort on all sides, either as scouts, detection dogs, sentries, messengers or supply carriers. They also proved very useful in controlling vermin populations in the trenches. When the United States joined the war in December, 1941, they travelled to France without dogs. Realising how fundamental they were to the Allied troops, not just because of their sharp senses and keen skills but because they boosted soldier morale, the British and the Belgians decided to loan trained dogs to the Americans – approximately 50,000 of them. Not only were dogs useful on the Front, but back home they proved invaluable resources, assisting in the rescue of many civilians during the Blitz bombings. The Dickin Medal for bravery was awarded to a number of these rescue dogs, including two German Shepherds named Irma and Jet who received the award in 1945, as well as a Collie named Peter. A mongrel named Rip also received the medal for its brave efforts locating victims of a London air-raid. Many animals have been involved in wars over the course of time, from horses and mules, to camels, elephants, birds and even glow-worms. However, one animal whose endeavours should never be forgotten is the pigeon. This creature, who many would never believe could be trained to partake in warfare, was employed on a large scale over the course of the First and Second World Wars as faithful message carriers. It is believed that roughly 100,000 pigeons were used in the Great War, and double the amount in the ensuing war. With a small canister attached to their leg containing a rolled up message, the pigeons would fly from one location to another, avoiding detection or interception. These birds would then be received and their messages would be read, before being directly dispatched to return with a written response. However dubious this tactic might have been considered before the war, the success rate of these birds actually reaching their destinations was 95%, thus making it the most reliable mode of communication. The Dickin Medal has been awarded to more pigeons than just about any other animal involved in war. In 1943, a pigeon named Winkie received the award after having flown 120 miles from a destroyed bomber plane to deliver an urgent SOS. Another unnamed pigeon was awarded the following year for having flown across the English Channel in the fastest recorded time, travelling an incredible 230 miles in approximately 4 hours. It is difficult to imagine some of the trials and tribulations faced by the millions of animals being remembered today. The sacrifices they made for their country should never be forgotten, just as they would never have forgotten their experiences of warfare. Don't forget to wear your purple poppy this Remembrance Day to pay tribute to the thousands of animals that never made it back from war. we should never forget how animals helped, even if most people never ever give them a second thought. 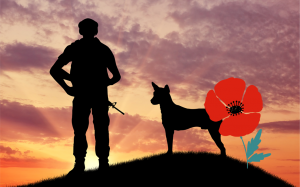 This is a special thank you to all the animals who gave their lives and worked so very hard during their time with the service men and women. I remember them with much love and gratitude. Next year I shall have the purple poppies for all my pets to wear. Thanks so much for reminding me of all those animals who have proved their devotion, loyalty and intelligence over the years, most whose names will never be known. Perhaps purple poppies should be sold and worn alongside the more familiar red ones. I knew about the Airedales & the work they did as I have 'dales & they are wonderful dogs. I also knew about horses & other dogs but not about pigeons. Where can you get purple poppies from please? On remembrance day I remember all the animals who died and gave their lives they did not understand what was happening. They showed courage and bravery and did what was asked of them remember them and their sacrifice. my way as a thank you. My Grandfather fought in the Great War for Civilisation. Thatâs what is engraved on one of his medals anyway. Itâs better known as WW1 He was actually just under age when he enlisted, but not on his paperwork! He was in charge of a team of six horses which pulled the Maxam gun. The six blacks he called them when he told me the story. I was a young girl 7 years old and I hung on my Grandads every word. He was my only Grandparent you see. He and his six blacks worked and fought together. Ate and slept together and their needs were tended to before his own. He was a true Horseman. They were a team of 7 together from the first day of the Great War to the very last day. He asked for permission for them to come home to England at the wars end. It was denied and along with thousands more they were slaughtered for food for the French people. His story falters there! As an adult I now realise it faltered because it broke his heart after all they had done, all they had given for him that he had to leave them there alone to be butchered! It was to be broken again just a few short years later when he lost my Grandmother in Childbirth. As he was lowered into his resting spot with my grandmother and their unborn son a salute was fired and afterwards the last post was sounded and my Auntie Christine his first born was presented with the flag! I think I was playing along with my cousins with a big jar of pennies he had saved which Mum had given to us to share. Our gift from him. When I first read his obit all my memories fell into place and my heart wept for him. Such a gentle, good, kind man who was loved by his family and respected by everyone who ever met him. I have remembered him at this time and others too with the utmost pride throughout my adult life!